Often we think of trees as our friends, living things, a natural companion to humans. Trees put oxygen back into the air. They are beautiful to see and hear the wind rustle through the branches. They provide shade and windbreaks. Trees are a small part of nature that is easy to enjoy. However, for a cedar allergy sufferer, not all trees are your friends! The University of Tulsa says cedar is “one of the most potent allergens in the United States.” Mountain cedar is a type of juniper tree found mainly in South and Central Texas that pollinates in the winter, from December through March. Other parts of the United States have related species of cedar, juniper, and cypress trees that cause springtime allergies. For example, Western red cedar and Eastern red cedar pollinate in March and April. Because pollen is so similar within this family of trees, a person who is allergic to mountain cedar pollen will also be allergic to pollen from juniper and cypress trees. 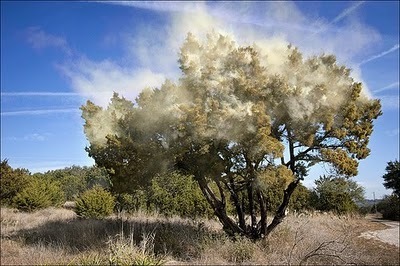 Twenty-five percent of the people in areas with mountain cedar suffer from its pollen 25% of the year. During pollination season, mountain cedar produce cones that simultaneously burst open upon optimal temperature and humidity conditions, releasing huge “clouds” of pollen. Tiny, light, buoyant cedar pollen granules can infiltrate the air and travel for long distances. These qualities also make them easy for humans to inhale and then trigger allergy and asthma heath effects. Cedar allergy symptoms include itchy, watery eyes, runny or stuffy nose, sneezing, postnasal drip, facial pain, headache, fatigue, sore throat, and ear congestion. These symptoms may be severe enough to cause loss of sleep and poor concentration, which then affects work, school, or other important activities. Wondering what to do about cedar allergies? First, get tested to determine if the symptoms really are caused by cedar allergy. Then, symptoms can then be managed with antihistamines, decongestants, and nasal corticosteroid drugs. Allergy injections, or immunotherapy, also successfully treat allergies to cedar pollen by reducing patients’ sensitivity levels over the long-term. Consult with an allergist for a personalized treatment solution. This entry was posted in Mountain Cedar, Symptoms and tagged Allergy, Juniperus ashei, Pollen on March 7, 2011 by Kari Larson.